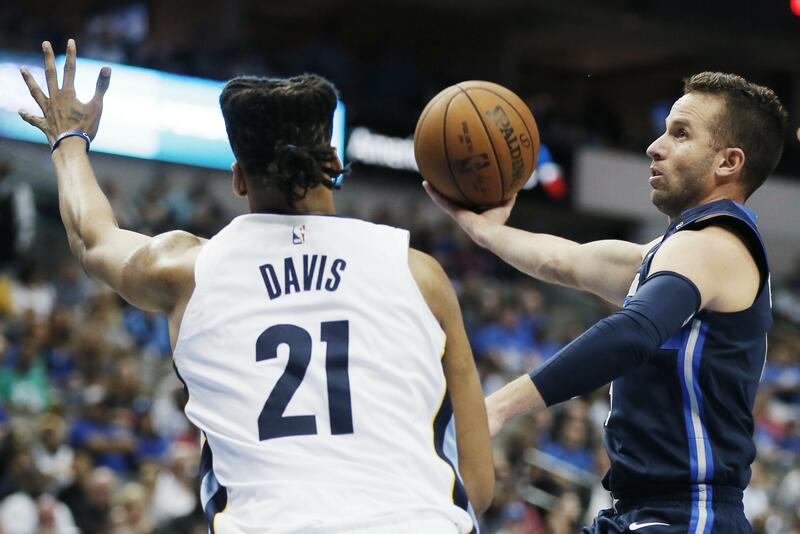 UPDATED: Sat., March 10, 2018, 10:42 p.m.
DALLAS – Harrison Barnes scored 25 points and the Dallas Mavericks beat Memphis 114-80 on Saturday night, extending the Grizzlies’ losing streak to 17 games. The Grizzlies (18-48), who have the longest losing streak in the NBA this season and the league’s worst record, trailed by 26 points after shooting 26 percent in the first half and didn’t lead after the 9:20 mark of the first quarter. The only longer losing streaks in franchise history were skids of 23 and 19 games in the expansion season of 1995-96 in Vancouver. It’s the longest losing streak in Memphis pro basketball history. Dillon Brooks led the Grizzlies with 17 points, and JaMychal Green had 14 points and 10 rebounds. The Mavericks (21-45), also among the NBA’s worst teams, allowed their fewest points in any half this season while building a 56-30 halftime lead on the way to their largest margin of victory this season. OKLAHOMA CITY – Russell Westbrook scored 21 points and posted his 19th triple-double of the season to help the Oklahoma City Thunder defeat the San Antonio Spurs. Westbrook had 12 rebounds and 10 assists in the 98th triple-double of his career. Jerami Grant scored 15 points, Corey Brewer added 12, Paul George and Alex Abrines each scored 11 and Patrick Patterson had 10 for the Thunder. Nick Collison scored all seven of his points in six critical minutes in the fourth quarter for Oklahoma City, which improved to 6-3 since the All-Star break. Rudy Gay and Davis Bertans each scored 14 points for the Spurs, who have lost eight of 10. MIAMI – James Johnson scored 20 points, Wayne Ellington added 17 and the Miami Heat ran away in the third quarter to beat the Washington Wizards. Dwyane Wade got the 8,000th field goal of his career in the first half, but left less than a minute into the fourth quarter with what was diagnosed as a mild left hamstring strain. He doesn’t expect to play on Monday when the Heat start a three-game road trip in Portland. Jodie Meeks scored 23 for the Wizards, whose five-game winning streak was snapped. CHARLOTTE, N.C. – Dwight Howard had 30 points and 12 rebounds, Nic Batum flirted with a triple-double and the Charlotte Hornets held on to beat the Phoenix Suns to snap a five-game losing streak. Batum added 29 points, 12 rebounds and seven assists and Marvin Williams chipped in with 16 points as the Hornets won despite nearly squandering a 22-point fourth quarter lead to a Suns team playing without star Devin Booker. The Hornets led by eight at halftime and seemed ready to put this one on cruise control after outscoring the Suns 35-21 in the third quarter behind 14 points from Batum. But Phoenix wouldn’t go away. The Suns cut the lead to two with less than a minute to go, but Howard and Batum each added two clutch free throws down the stretch to secure the win for Charlotte. LOS ANGELES – Lou Williams scored 25 points and Tobias Harris had 21, as the Los Angeles Clippers pulled away in the fourth quarter for a victory over the Orlando Magic. The Clippers moved a half-game ahead of Denver and Utah in the race for the final Western Conference playoff spot. Jonathan Simmons led Orlando with 24 points. D.J. Augustin added 19 and Nikola Vucevic had 17 points and 10 rebounds. DeAndre Jordan had 18 rebounds for the Clippers, and Milos Teodosic added 15 points and seven assists. Published: March 10, 2018, 10:27 p.m. Updated: March 10, 2018, 10:42 p.m.